First of all I want to apologize for the tardiness of our newsletter. In an attempt to make our newsletter both written and video, we had some technical difficulties. 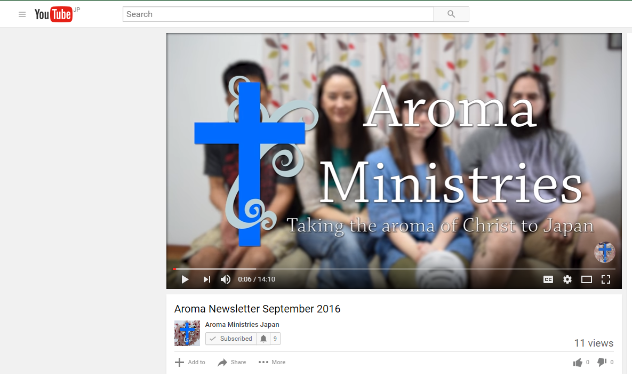 We are excited however to be coming to you this month with a video format to keep you informed about the ministry. Thank you for praying for the trip to Kumamoto for earthquake relief efforts and outreach that BFF was able to participate in last month. Rocky provides an update on that in the video. It was an incredible opportunity for the BFF adults and kids alike to serve through the summer festival that was held at a church in the hardest hit area. The pastor was able to spend the day talking with and deepening relationships with newcomers while our team and the members of another local Kitakyushu church served in the various festival booths! Please keep praying for Kumamoto. Bible studies continue to be a great way to dig deeper into the Word with our BFF members. We actually have quite a few Bible studies going on and we talk about some of them in the video. Would you pray for the members of those Bible studies, both believers and seekers. Pray that God would keep drawing them closer and closer to Him through His Word! We are especially excited about our growing relationship with a local Christian school, and the Bible study they are allowing us to do on campus with the Jr. High and High School students! Please also be in prayer for BFF in the month of November as we will be having a Vision Meeting. Pray that God would help us as leaders cast the vision for BFF clearly and boldly to those who are attending regularly. Pray that those whom God is calling to join this work, and move forward into the future of BFF's vision to be a network of multiplying church plants, will catch the vision and boldly want to commit to the work ahead!!! Christmas is quickly approaching! We look forward to celebrating the birth of our Savior as a church family and hope that it will be a time when many can invite newcomers to experience the fellowship of BFF. If you would be interested in helping to provide for the special Christmas Eve BFF worship service, where we plan to have special activities and dessert, would you please reply to this message and ask for more details. One Sunday School class is already volunteering to fulfill some of our needs, but we may need one or two more who are willing to pitch in with some supplies that are more easily obtained in the US! Thank you!!! Here is a link to the video if you want to hear us share more in depth about this things on camera!! !